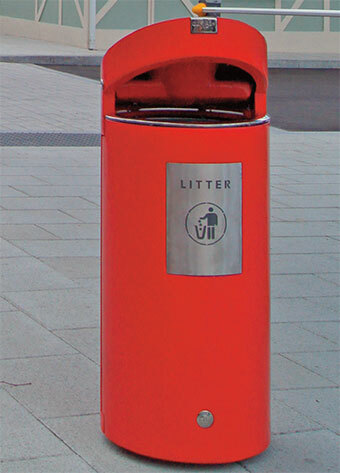 Angled top large cast ductile iron litter bin. Round in shape with 1 litter posting aperture 400 x 150mm. Manufactured from 12mm cast ductile iron with 316 grade stainless steel. Extremely vandal and impact resistant. Stainless steel aperture rim to protect paint work and prevent chipping. Fully galvanised with powder coat finish, as we manufacture all our products in house we can arrange any colour combination you require. Stainless steel stubber plate with key operated ash hopper. 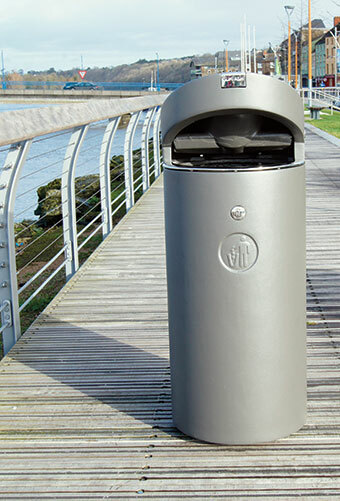 Common key for rubbish and ash bin access for easy emptying. Robust and anti-vandal hinging mechanism, using 16mm stainless steel shaft on door. Heavy duty sealed galvanised steel liner. Supplied with detachable base plate both for ease of installation and removal without disturbing ground fixings. There are 4 fixing points on the base for fitting to the ground by means of anchoring bolts. Recommended concrete foundation 900 x 900 x 150mm. Levelling plates to help cater for different street gradients. Available with or without advertising panel. Town logos can be incorporated if required.